While I was "heads down" all last week trying to wrestle this blog to the ground, and learning more than I ever wanted to know about HTML, CSS, XML, RSS, and MMBA's (Many More Blog Acronyms) , I managed to completely miss this great thread posted by Jon Henke at The QandO blog. Interestingly, my last post linked to an older QandO post on the same subject, but somehow managed to miss this one. Sigh... I am just not getting the hang of this blog thing. Anyway, I was just going to leave a comment, but as I am a week late to the party, and everyone has moved on to the hot topic of the day, I decided to instead respond here (and cross-post there). One (Party) Ring by Jon Henke on the QandO blog. Many Republicans — the actual fiscal conservatives and libertarians, anyway — are becoming more and more disaffected with this state of affairs... The modern Republican is Gandalf, having won the primary against Frodo, and fidgeting with the Ring of Power in his palm. So much good I could do, so many people I could help, if I only slipped it on, and besides, you just know that Saruman would wear the Ring if his party took Congress... It seems to me that the optimal libertarian and fiscal conservative strategy is to seek gridlock. And if that means a temporary alliance with the Democrats, well, what of it? The Democrats may be worse than the Republicans in many ways, but a divided government can thwart the ambitions of both... we probably ought to explore our free agency, rather than becoming dependable votes in the future. The Democrats will certainly be The Enemy again, but not until they are actually in charge of something. In the meantime, libertarians oppose an overweening State and the Republican Party is the State. Do the math." To support the documented benefit of divided government by voting Democratic in the 2006 election, is not the same as "finding a home" in the Democratic party. It is simply tactical support to obtain an immediate and desireable result: Fiscal restraint and better federal governance through the mechanism of divided government. To continue to support Republican single party control of the Federal Government in the face of what has actually transpired over the last five years can only be read as a naked appeal to "pay attention to what Republicans say, but ignore what they. In fact, by achieving the result of divided government through the support of Democratic candidates in 2006, the supporters of limited government will have a stronger foundation for supporting the Republican presidential candidate in 2008, with the enhanced hope that the next Republican President will actually "walk the walk". How do you propose to turn gridlock into improvement? Ok, I'll take a crack at it. First, divided government (defined as executive and legislative branch not controlled by the same party) is not equal to gridlock, although it can have that temporary result. This administration proved that single party Republican control can be as wildly profligate as single party Democratic control. Divided government is documented by Niskanen and Ritter to restrain spending. It is a simple hstorical fact. We can guess at the mechanism of wny it works, but the fact that it does work can and should be accepted as empirical fact. Yes, this is the preferred libertarian response. One I have used myself. It is a vote for principle. It is a vote for futility. It is a vote for continuing the political irrelevance of the libertarian party. This misses the point. The idea is not to join the Democrat party. The point is to accomplish a libertarian objective of restraining gevernment growth and spending by casting a tactical vote for the Democrats in 2006. Think of it as the usual libertarian response of throwing away your vote, but accidently actually accomplishing a libertarian objective by doing it. Theory ... We’ve seen rather large deficits basically since Nixon was forced out of office.. Simple in concept, that is. Devilishly hard to do in reality. You have to figure out who really are the right people, and they have to figure out how to sell themselves, and we actually have to pull the levers..."
Actually it is more than theory. It is historical fact. Yes there are always large deficits, but Niskanen and Ritter show that they are larger and grow faster when you have single party control of the legislative and executive branch. Perhaps this is not as devilishly hard as you might think. The dynamic of divided government accomplishes the desired objective of restraining government growth, not the individuals or parties that make up that divided government state, or even what they say or believe. Democrats (or Republicans) do not create the result. Divided government does. Republican vs. Democrat is a false choice. Single Party vs. Divided Government is the real choice. Voting Democrat will sure send that "we want less government" message. . The only options I see are "R" or "L". So Don, how has that only "R" or "L" thing worked out for you over the last five years? Re-elect this generation of big government Republican congressman into another majority with this big government President, and guess what you will get for the next two years? It's pretty simple really. You want to vote for that? Hey knock yourself out. To be even more of a stickler, there was no surplus under Clinton. The debt increased every year just as it has done since 1960. True. But spending growth was restrained. You have to stop the bleeding before you can heal the patient. And it was not Clinton that created the fiscal restraint. It was the dynamic of a divided government. No one believes that. The Dem party will not restrain government growth. 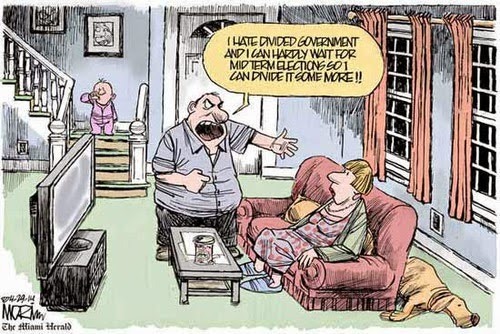 A divided government will. In any case, the presidential election is in 2008. This is 2006. We have an election in four months. 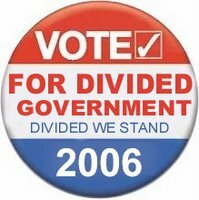 Vote for divided government now, stop the bleeding, then vote for a "born-again" fiscally conservative Republican in '08. This is not about finding a home in the Demcratic party. This is not about trying to change the Democratic party. This is not about whether you feel wanted by the Democratic party. This is not about whether they "really, really like you". This is about voting for an objective of limiting government growth through the known mechanism of electing and maintaining a divided government in Washington. This is not about finding a home in the Democratic party. This is not about trying to change the Democratic party. This is about voting for the objective of limiting government growth through the known mechanism of electing and maintaining a divided government in Washington. The best I can do is help the Democrats "purify" the Democratic party? Sorry. I’ll join the ranks of the non-voters first ... better we should all write in "Gridlock" so that everyone knows where we stand and how to get our vote in the future. This is not about finding a home in the Democratic party. This is not about trying to change the Democratic party. This is about voting for an objective of limiting government growth through the known mechanism of electing and maintaining a divided government in Washington. Elect a divided government in '06, then you can waste your vote in '08 like a good libertarian. Regarding Clinton’s surpluses: only a fool would vote for the Democrats in the expectation that future Democratic administrations will model themselves after Clinton’s... The fact is that the Republicans have shamelessly violated their core principles of limited government and fiscal responsibility, but the Democrats have never had any such principles in the past and are not claiming to have them now. That is not the expectation. The expectation is that a divided government will restrain the growth of government because it historically has been shown to do so by Niskanen et.al. It is a tactic, not a strategy.The Democrats won't do it. The Republicans won't do it. 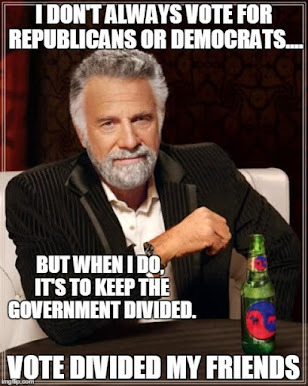 A divided Federal government will. True. Great ideas, all. But are they going to happen in the next four months? If not, then vote for Divided Government now, stop the bleeding, and we might be able to start the process of getting some of this institutional reform in '08. If that is the best plan, libertarians might as well quit politics and become a gardening club. I would prefer to sit out entirely than to give our mandate to a party that represents the polar opposite of everything we stand for. As opposed to a party that says one thing in order to make Aldo feel good about voting for them, then actually does the polar opposite of everything he stands for. Got it. That is much better, of course. But - as a practical matter - sitting out is almost as good as voting positively for divided government. How is gridlock improvement? Well, if you were on a boat that was sinking, and you managed to bail out just enough water so you didn’t sink further, that would be an improvement. It’s not a solution, but a stop-gap measure. A way to try and play one side off the other until you can get the "right" people, or the "right" legislation enacted to correct things. The odds of your one vote changing the outcome of any election is very, very small. I recommend Keith’s #4 (vote your conscience). I’m more or less a one issue voter. I don’t vote for drug warriors. Ever. Or at least not for any office which has a role in the drug war. Which means I vote Libertarian almost exclusively. And it’s so easy. I always leave my polling place with a spring in my step, whistling a happy tune. My candidates don’t win of course, but so what? The voice of my individual vote speaks much more loudly from the Libertarian column than it would from the Dem or Republican column. And maybe if the voices from the Lib column grow loud enough, the other two party candidates will notice, and even co-opt some Lib positions, which frankly is fine by me. In terms of our individual votes, all of this strategizing is more or less meaningless. The winner of the election will very, very, very likely win with or without your individual vote. And it’s like the man said: if we alway do what we’ve always done, we’ll always get what we’ve always gotten. Actually, Peter - your (our) candidates don't win at all. Ever. I have voted this way. It is easy. It is voting for principle. Voting this way is also the reason that libertarians are an impotent political force. Libertarian ideas are powerful ideas that do have an impact on the politcal dialog, but libertarian politics are irrelevant. Why not vote to accomplish a libertarian objective instead of only a libertarion principle? This is another easy way to vote in '06 and actually have a real impact. It is certainly true, that we are talking very long odds here. But in '06, with a limited turnout, and a highly polarized electorate, it is just possible that a simple idea, widely communicated, to a relatively very few voters on the margin can make a difference. If only there was some sort of ubiquitous communication medium that had the potential of getting this idea widely disseminated, we might get just enough votes to make a difference. Something like a vast network of tubes. Too bad it does not exist. If it did we could let the politicians know that there is a libertarian voting block that does not throw it's vote away every election. What is needed, for this to work in this very short time-frame, is an organizing principle. A principle that is so obvious, so logical, and so clear-cut, that no leadership is needed, no parties are needed, no candidates are needed, and no infrastructure is needed. Ideally it is just this easy: You think about the principle, and you know how to vote. That organizing principle exists. It is Divided Government. It is absolutely clear-cut and easy to understand. Divided Government is documented by Niskanen et.al. to work in a practical real-world manner to restrain the growth of the state. The entire idea can be communicated in a sound byte. As a voting strategy it can be implemented immediately. Whatever the percentage of the electorate that libertarians and disgruntled limited government advocates represent, whether it is 9% or 20%, if they vote as a block for Divided Government, they become the brokers of an evenly split partisan electorate. They arguably become the single most most potent voting block in the country, specifically because they are willing to vote either Democratic or Republican as a block. Specifically because they are not fused to one party or the other. It means, libertarians must ignore what the politicians say and look at what they actually do (Niskanen again). It means ignoring spurious invitations to fuse with either "big tent" party that no longer stands for anything meaningful. It means voting straight Democratic in 2006, and (if successful in establishing divided government) voting Republican for President in 2008. It means the difference between libertarians being a completely impotent political force, and libertarians having the biggest swinging political "hammer" in town. And it can be done this year. It can be done in the next three months. Dude, look, you've definitely convinced me that you're convinced. And I'm also completely convinced of your sincerity, and I tend to give the benefit of the doubt to sincerity. But about the Republicans, I don't see how handing them an electoral defeat will convince them to shimmy back over to limited government. The last forty years has been about both parties moving toward the middle, but when it comes to the size of government, it's the Republicans that have done all the moving, and it's all been in the exact opposite direction that we want it to go. Bush and the current Congressional delegation are exhibits A and B. And the Democrats have a really big problem: for the most part, they simply aren't capitalists. They cling ferociously to the belief that government power is the end all be all. They've long since found they're magic hammer, and we're they're nails. When the Republicans lurch leftward on social spending, the Dems reflexively double-down. What we wind up with in the end is a one-way ratchet effect from both major parties towards Kudzu-like goverment. And don't try too hard to convince me. I live in Austin, the Santa Monica of TX, and my Congressman is the incumbent Lloyd Doggett, Democrat. He's a big unreformed leftie, and he's going to win big, again, with probably 60% of the vote, so getting me to vote for him won't add much to your mission. But hey, rock on with your bad self. I could be completely wrong. Oh by the way, you do know you are Liberal Capitalist, right? Hmph. I guess I could add that to my ever expanding profile: "Social liberal, fiscal conservative, deficit hawk, Reagan Democrat, libertarian leaning independent, Liberal Capitalist. This label thing is getting complex. This test pegs me as right leaning moderate Libertarian. This test pegs me as a left leaning Libertarian. While this test pegs me as a subscriber to the Chicago School of economics (Milton Friedman). I guess I should add that too:"Social liberal, fiscal conservative, deficit hawk, Reagan Democrat, libertarian leaning independent, Liberal Capitalist - Chicago School of economics. Blogger does not give me enough characters in my profile. You seem to want to understand why divided government works to restrain spending growth in terms of changing the nature of Republicans or Democrats. It does not change their nature, and it does not require either party to "shimmy to the right" to have the effect oc rstraining the growth of spending. The effect is a consequence of neither party in majority control - with Dems still being Dems and Reps still being Reps. The pols don't change their stripes, but the effect happens anyway. I don't know why. Professors write books about it. I just know it is a documented historical empirical fact, and that basis is good enough for me to support it.